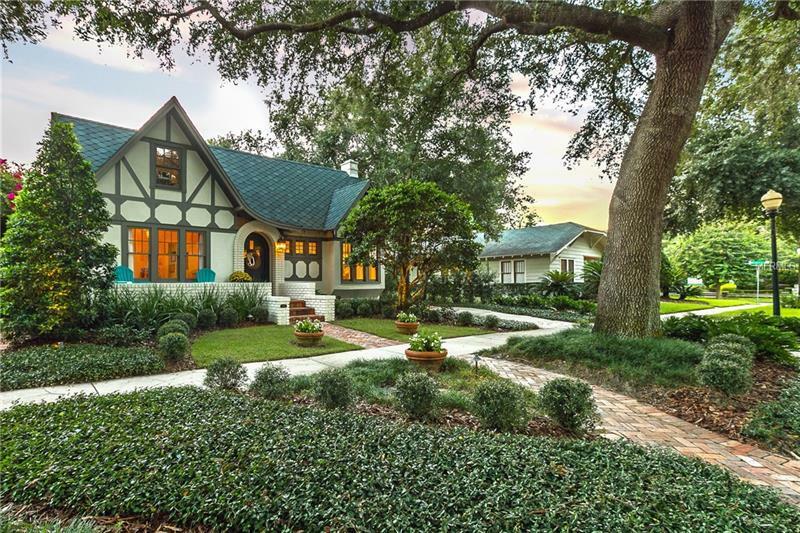 Gorgeously updated Tudor Revival in the Lake Copeland Historic District of Delaney Park! This meticulously maintained 4 bedroom, 3 bathroom features an amazing 2017 kitchen renovation with new wiring, plumbing, cabinets, countertops, appliances, and lighting. A new natural gas line was added in 2016, as well as a tank-less water heater and gas fireplace. December 2013 a new roof was installed with a transferable warranty. New AC system installed in 2014. All new landscaping and irrigation system installed 2015. In addition to the modern amenity updates, this home keeps the charm and character of the era with hardwood floors, custom built-ins, and crown molding. Enjoy coffee on your large front porch or host your friends on the large private patio in back. The carriage house in back functions for extra storage and was previously used as a home office. Located on a quaint and quiet one way street, this charmer is a short walk to Delaney Park, ORMC, and a short drive to downtown Orlando. On top of all these amazing features, the home is zoned for highly sought after Boone/Blankner school district! Come see what true pride of ownership looks like in one of downtown Orlando's top neighborhoods!